A portable fire extinguisher can save lives and property by putting out a small fire or containing it so you may exit the building safely. Interested in becoming trained in the use of a Fire Extinguisher? - Squeeze the levers slowly and evenly. 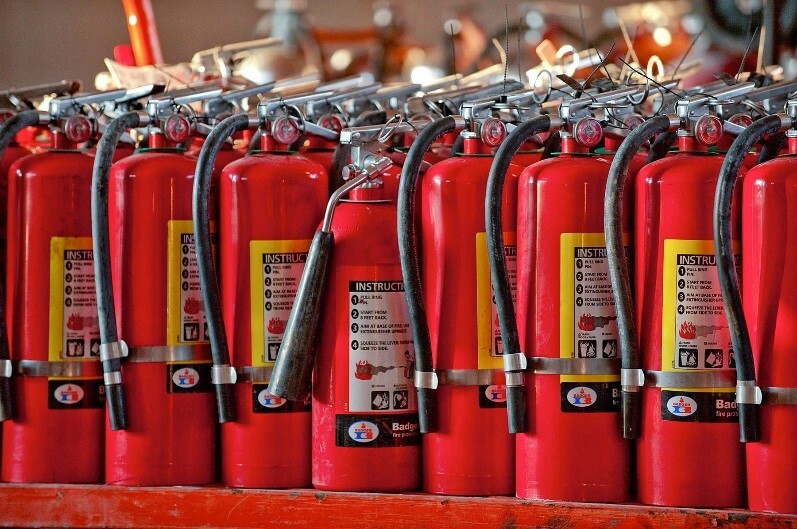 Like any mechanical device, fire extinguishers must be maintained on a regular basis to ensure their proper operation. The EH&S Office (EHSO) is responsible for overseeing the fire extinguisher maintenance program. The EHSO also provides fire extinguishers upon request in support of student events. The EHSO will also provide a replacement fire extinguisher for your work area or residence hall if you note that an extinguisher is missing from it mount location; if the extiguisher has been discharged; or if you believe the extinguisher may no longer be serviceable. Fire extinguishers must be inspected or given a "quick check" every 30 days. In addition, fire extinguishers must be maintained annually in accordance with local, state and national codes and regulations. The annual inspection consists of a thorough examination of the fire extinguisher's mechanical parts; fire extinguishing agent and the expellant gas. The annual inspection is performed each January by a fire extinguisher service company and is coordinated through the EHSO. How will I know if my fire extinguisher has had its annual inspection? Look for the plastic tag on the handle that holds the pin in place. If the annual inspection is current, the extinguisher will have a plastic tag with the current calendar year stamped on it. If you find an extinguisher that has a missing plastic tag or has a plastic tag stamped with an out-of-date calendar year, notify the EHSO. Why doesn't my extinguisher have an inspection tag for recording the monthly inspection? Fire extinguisher inspections at William & Mary are tracked using a barcoding system. Once an extinguisher inspection is complete, the inspector will scan the extinguisher's barcode. The inspector will also record in the barcode system if there were any deficiencies noted such as a missing pin, or a broken hanging bracket. Inspection records are downloaded from the barcode reader, stored in a spreadsheet and are available for review upon request. Use of the barcode system has allowed William & Mary to eliminate the hang tags. Test Your Portable Fire Extinguisher Knowledge!